As with his signature buildings, the Pritzker Prize-winning architect likes to upend the rules and look to the future with his philanthropy. Forty years later, in 2011, the architect had a fortuitous dinner with his friend Bobby Shriver, the philanthropist and former mayor of Santa Monica, at which he met Shriver’s glamorous wife, Malissa Feruzzi Shriver (pictured top, with Gehry), who was close to the end of a five-year term as chair of the California Arts Council. “I want to do something in arts education,” Gehry told her. But it had to be big—”Shriver big,” he added jokingly. To illustrate the scale he had in mind, he mentioned that he had recently visited Venezuela, where he had witnessed “El Sistema,” the country’s extraordinary musical education program that involves poor children in the orchestras. “It’s a model for everyone,” Gehry says. Fortunately, Malissa Shriver knew of an incipient project close to the heart of First Lady Michelle Obama: the Turnaround Arts program, which is targeted at underserved and underperforming elementary schools. In 2011 the program was operative in eight states; Shriver lobbied for California to become the ninth. Gehry himself would put in money, as would the state government and private arts foundations. In May 2014 the California branch of Turnaround Arts was launched, at a White House ceremony during which President Obama and the first lady spoke. At its outset the program served 10 elementary schools, each of which was assigned an artistic mentor from a group that currently includes Forest Whitaker, Kerry Washington, Chad Smith of the Red Hot Chili Peppers, Tim Robbins, Russell Simmons, and Rashida Jones. 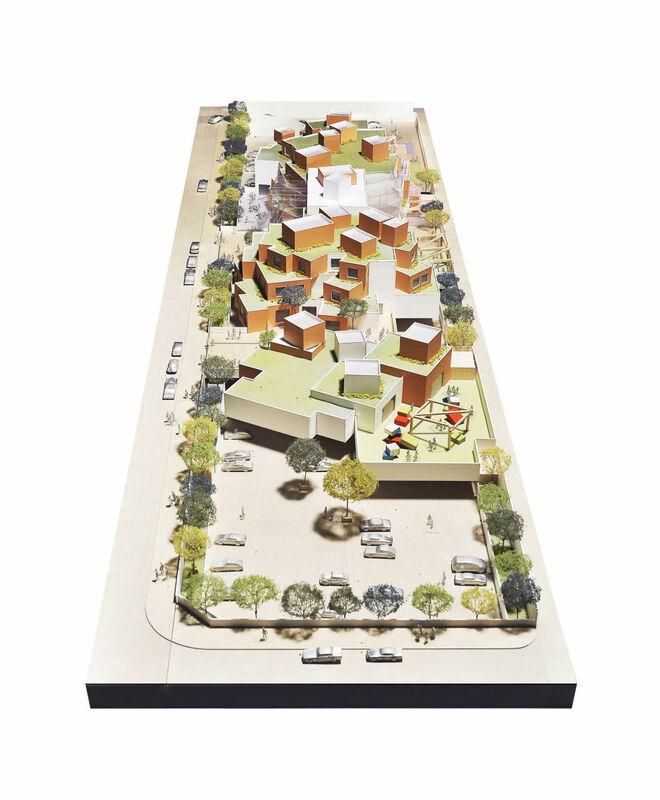 Shriver and a staff of three oversee the program from offices at Gehry Partners, in Santa Monica. Metrics, she says, show increased school attendance and better performance. This year the program will take on five more schools. For himself Gehry chose Hoopa Valley Elementary School, on Indian land in rural northern California. “It interested me because it was an enclosed society,” Gehry says. “It was a chance for me to learn as well as to help.” On his first visit the architect asked to be introduced to at-risk students. “He spends hours talking to them, asking about their lives,” Shriver says. 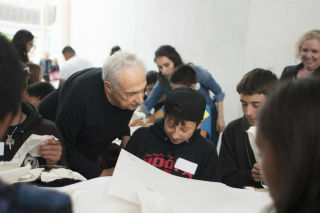 The children also visit the Gehry offices, where they paint fish sculptures and build cardboard towns, some of which “are just amazingly beautiful,” Gehry says, adding, “if they learn they can create something of value for themselves, they won’t turn back.” He recalls one boy who was initially wary; eventually he was coaxed into cutting up cardboard, and then he “opened like a flower.” He now corresponds with the architect. “Frank’s philanthropy is all about personal relationships,” Shriver says. There’s no grand plan or formal announcement; Gehry has simply given to causes that resonate with him, and over time, in parallel with his career, the scope of his involvement has mushroomed. Those causes go way beyond education. In 1968, Milton Wexler, a Los Angeles psychoanalyst, started the Hereditary Disease Foundation after discovering that his wife had Huntington’s disease, an incurable neurological disorder. “Milton treated artists for free. I was one of them,” says Gehry, crediting Wexler with helping him during a dark period. In 2008 the architect’s daughter Leslie Gehry Brenner died of uterine cancer, at 54; she left her estate to the Hereditary Disease Foundation—a gift Gehry matched dollar for dollar. Moreover, since 2010, Gehry has funded an annual prize of $100,000 for a scientist working on Huntington’s. Another of Gehry’s friendships is with Argentine-Israeli conductor Daniel Barenboim, who, with the late Palestinian scholar Edward Said, founded the West-Eastern Divan Orchestra, which brings together young musicians from Israel, Palestine, Syria, and other Arab countries. The orchestra performs around the world throughout the year. Barenboim wanted a permanent home, however, and Gehry, whose love of music is well documented, stepped in to help. Next year the Barenboim-Said Akademie‘s rehearsal hall, designed by Gehry, will open in Berlin. “People understand each other better through the arts,” he says. THE GEHRY-DESIGNED WATTS CAMPUS OF THE CHILDREN’S INSTITUTE INC., IN LOS ANGELES. Meanwhile, his protégé at the Hoopa Valley school remains on his mind. On a recent visit to the reservation Gehry was unable to find the boy; the architect asked him to call, and so far he hasn’t. So Gehry is going to call him. “I will pursue this,” he says determinedly. He has spent 40 years wanting to make this kind of difference. Now it’s time to make sure it actually happens.